To responsibly source fine ethnographic and garden art for preservation, curated exhibition and sale to discerning clients and educational or fine arts institutions. To conduct curated fine art exhibitions across the United States of America in partnership with and benefiting important and relevant local community non-profit environmental, educational, and fine art organizations. To donate works of art to relevant non-profit organizations for fund raising purposes. To involve family members in our art exhibition activities as a means of teaching ethical business practices and implementing our social mission. To contribute to the appreciation of fine art and the cultural contexts in which these pieces were designed, created, and in some cases used by indigenous cultures. When possible to support local indigenous cultures and artisans connected with the art we sell. Schneible Fine Arts LLC Gallery co-owner and president Douglas Schneible has been an international businessman, art collector, teacher, and history buff for most of his life. He started collecting American folk art – pyrography (wood burned art) – and amassed one of the finest collections extant. Later on his interests turned to ethnographic art including Oceanic tribal sculptures, Chinese Neolithic pottery, Chinese Dream stones, Native American works as well as fine Japanese art. Today he seeks and treasures, among others, authentic old Japanese and Asian garden stones and sculptures. Feeding this art appreciation and collecting passion was his interest in international business and world travel. In the 1970’s he co-founded an international coins and currency mail order company and traveled extensively throughout Eastern Europe and China. By the late 1980’s he started a wholesale gift import company while manufacturing in China. 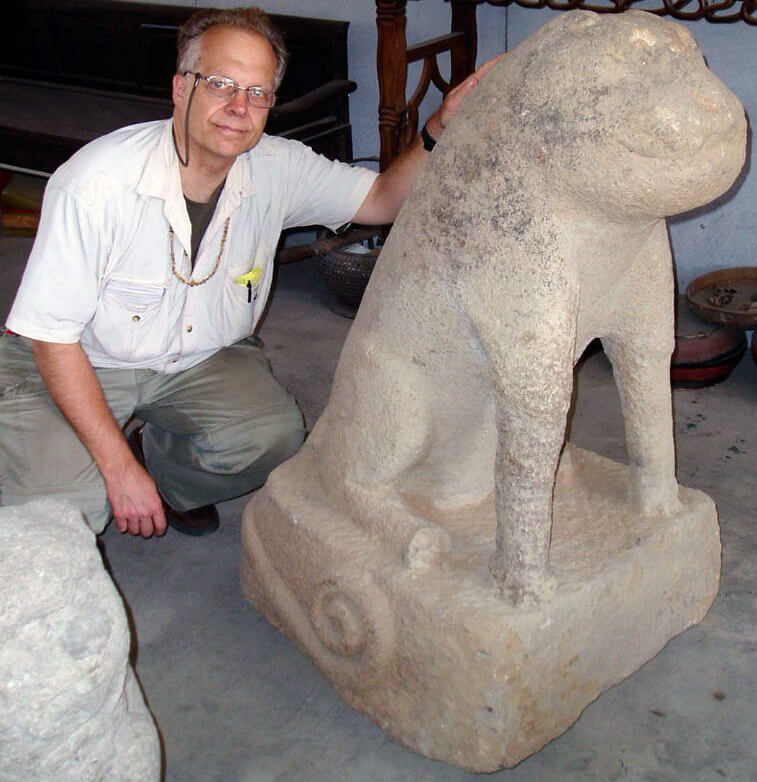 In 1995 he began Arts & Crafts Gallery LLC, which gave birth to Schneible Fine Arts LLC, servicing clients who seek authentic high quality Japanese, Chinese, and ethnographic antiques and garden art. It is his invaluable international business and unique “collecting” perspective coupled with his extensive sourcing experiences which he feels benefits communities and clients. Anita L Royer, Schneible Fine Arts LLC co-owner and VP, has worked behind the scenes and in the SFA gallery and exhibitions for over 14 years, and along with Douglas enjoys helping our wonderful SFA clients find their favorite pieces for their personal collections. She is passionate about Asian and all ethnographic art for its’ beauty, cultural, and historical representation, as a bridge across cultural divides, and as an investment in the preservation of our global identity. Anita has been intrigued for years by the East/West cultural juxtaposition, and the remarkable synergistic potential that exists between the two hemispheres for understanding and peace. More recently, a keen interest in the meditative and healing properties of Japanese gardens has come into the foreground. She was raised with a appreciation for the Japanese garden aesthetic, and combined with her prior professional background and Masters in Medical/Clinical Social Work, is staying attuned to their application for health promotion across populations. Douglas and his wife Anita continue to develop the company’s growing international internet businesses and are currently transitioning from their home and business in Shelburne, Vermont to Newport, Rhode Island.